Investing your hard earned money into a dividend stock portfolio is one of the most sustainable income streams you can build. As long as you invest in the top dividend paying companies … your income stream will likely grow year after year … with very little work on your part. How cool is that? You no longer have to trade time for income. Instead you invest your current income so that it creates more income and you can spend time on important things in life. Now I will point out that building a portfolio of dividend stocks is not a quick source of income. It takes time and capital and even a little patience to weather the ups and downs of the stock market. But the sooner you get started, the more time you will have to watch your portfolio grow and compound every year. After slowly building our portfolio over the past 9+ years, we earned just under $2,000 last year in dividend income. This year we are projected to earn about $2,400 … which is a 20% increase. Some of that increase was from reinvested dividends and company dividend increases. However, most of the jump was from new money invested into the market. So the more money we can invest now, the greater our dividend income will be years down the road. That is why we set a goal to increase our future dividend income up to $3,000 by the end of 2017. By doing so, it would all but guarantee earning $3,000 in dividend income in 2018. So in order to reach this goal, we are focused on investing a good portion of our income each month. 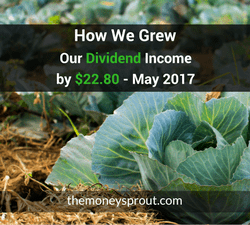 Here is a recap of our May results of growing our dividend income. Note – All stocks bought in May did not have any commissions or fee’s charged as we used our zero cost broker and third party transfer agent – Robinhood and Amstock. The following list shows stocks we purchased in May. Even though we invested in only 3 stocks, it was the third highest monthly investment total for 2017. Note – We did not sell any stock during May. After calculating our new purchases, we invested $1,232.63 in new money in May. This has increased our net forward annual dividend income by $48.72. The yield on cost for these new investments is 3.95%. During May, we invested ($197.37) less than our monthly goal ($1,232.63 – $1,430.00). After falling behind for the past several months, we were able to catch up during April by investing our tax refund. We kept the momentum up in May and almost hit our target set back last fall. Note – We are now $1,381.81 ahead of our investment goals. At the start of May, our estimated annual dividend income was $2,560.85 (after April and a few May investments). The goal by the end of 2017 is to push this number up to $3,000. Our updated annual dividend income estimates as of the end of May rose to $2,583.65. That is a $22.80 increase since last reporting. Note – Our April update came a couple weeks into May and included several new investments in the total. Most of the increase was a result of the new investments we made in May. The remainder of the increase came from reinvested dividends, and several company dividend increases. On average, we need to try and increase our future dividend income by $64.29 each month. In 7 months, we have increased our future dividend income by $483.65. We are now ahead by $33.62. Now that we have caught up on our investments in April and May, we still need to focus on increasing our monthly savings. We have spent most of 2017 behind schedule and only caught up because of investing our tax refund in April. The good news is that all of the investments in May were from new money … so our savings strategy is starting to work. Full Disclosure – At the time of this writing, we owned shares in the following stocks noted in this post – CINF, CSCO, and O. The material above is not a recommendation to buy. Please do your own research on a company before deciding to invest.